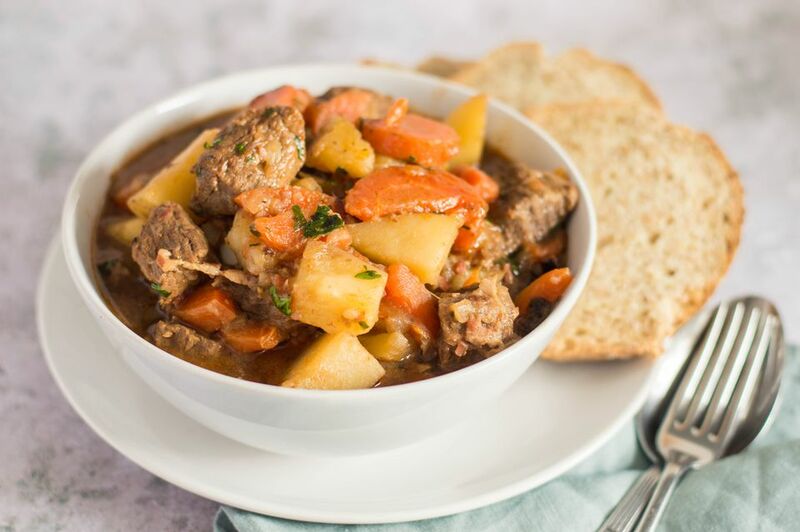 This beef and Guinness stew is super easy to make with some bacon, stewing beef, Guinness Stout, and vegetables. It's the perfect stew to make on a cold day. Or make it for your St. Patrick's Day celebration. Guinness Stout adds bold flavor to this hearty beef stew. Use round or lean chuck in this recipe. Enjoy the stew with crusty rolls or biscuits along with a tossed salad and a mug of stout. Or serve it with this classic Irish soda bread. Prepare it on the weekend for a busy Monday meal. The recipe makes about six generous servings. In a large saucepan or Dutch oven over medium heat, cook the bacon, turning, until lightly browned. In a food storage bag, combine the flour, 1/2 teaspoon of salt, and pepper. Add beef cubes and toss until well coated. Add the beef and onions to the bacon and continue cooking, frequently turning, until beef and onions are browned. Add the garlic and cook, stirring, for 1 minute longer. Then add the carrots, stout, and broth. Stir in the tomato paste and Worcestershire sauce. Reduce heat to low, cover, and cook at a low simmer for 1 1/2 to 2 hours, or until beef is very tender. Add the thyme and potatoes to the beef mixture and bring to a boil. Cover, reduce heat and simmer for about 30 minutes longer, or until potatoes are tender. Stir in the parsley and add salt and pepper, to taste. Cook for 5 minutes longer. Serve with crusty rolls, biscuits, or slices of freshly baked Irish soda bread.